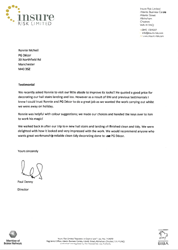 Here are some of the positive feedback we have received from our clients. Some jobs are so specialist that only a specialist team will do. A specialist like Skillhaus. 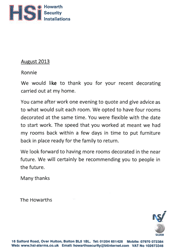 When Forrest & Jones was tasked with supplying a bespoke digitally printed wallpaper for the refurbishment of Room on King Street in central Manchester, they knew full well that the project demanded and deserved the very best interior decor team. 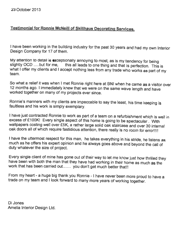 Not only did the quality of the work need to be top drawer, timescales were super tight. With a Jacamo Fashion film crew scheduled to start work onsite within the week, there was simply no margin for error. 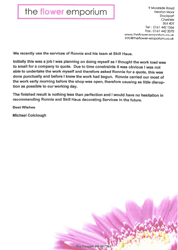 Another important consideration for Skillhaus was that the restaurant needed to be continually operational. “We worked all night”, says Skillhaus MD Ronnie McNeill. “Everynight”. From 11pm through to 8am Ronnie and his team soaked, re-soaked, stripped and hung. And before leaving site left the team made sure that all evidence of their busy night was carefully cleared away. “Diners wouldn’t have had a clue we were even there”, says Ronnie. “We planned our work to make sure that no part of any wall was left uncovered during opening hours. We were also absolutely fanatical about leaving the restaurant spotless every morning”. 1.3 metres wide and 30 metres long the roll of special wall covering certainly took some handling. Where others would almost certainly have struggled the Skillhaus team, skilled and experienced in ‘lap and splice’, quickly and easily formed their own joints. Sometimes jobs are so specialist that only a specialist will do. And when it comes to expertly hanging digital wallpaper? Only a specialist like Skillhaus. And that Jacamo Fashion filming?